Combine the power of your smartphone with discreet digital hearing aids to Get Control of Your Hearing! The HCEQ is an excellent choice if you are able to understand conversation in most situations, but experience more difficulty with soft speakers and noisy environments and want to take control of your hearing. The new HCEQ Smart Hearing Aid lets you take a more personal, customized approach to helping you hear better in your daily listening environments. 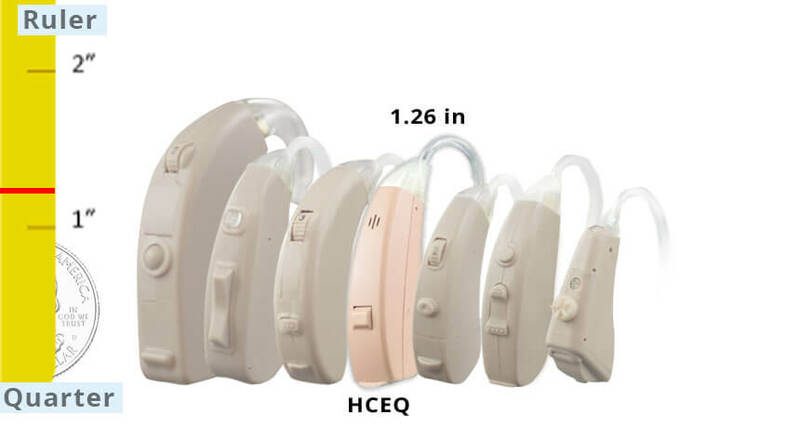 The HCEQ is designed for you if you have a noticeable to significant hearing loss and want to eliminate the requirement to visit a local hearing center for fine-tuning. Unlike your typical cheap hearing aids, just tap your iPhone or Android to turn on noise reduction, change volume, and fine-tune (or EQ) frequencies across the board. Even better, once you have found your preferred settings, you can turn off your phone and hearing aids at night, then wake up the next day with your preferences saved when you turn them back on! Smart Hearing Aids are a Smart Choice! Eliminate the need for office visits and stop worrying about fidgeting with the tiny controls on your hearing aids. Simply fine tune to what is comfortable for YOU and customize your experience with a product that fits YOU! Who can say what sounds “right” to you better than you? Discreetly bring speech into focus, turn on noise reduction, or adjust volume from your smartphone. Cut the low frequencies to reduce background noise—boost the mids and highs to make speech “pop” above the noise. Keep track of your battery level and choose your preferred program. Do a hearing check and preliminary calibration. Turn on and off through the app. 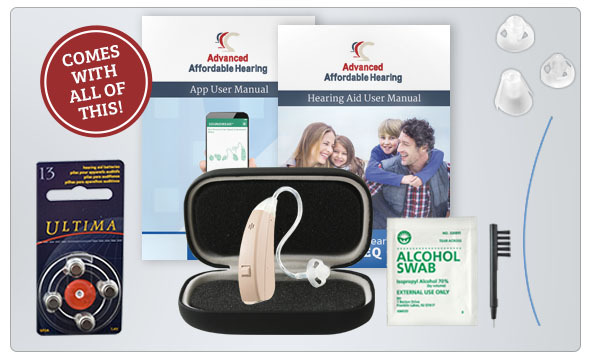 This product is available by pre-programmed ($429 each/$798 pair) to provide help for the most common hearing loss level—Noticeable to Significant. Ask about custom programming your HCEQ’s to your hearing test! To include customized programming with your HCEQ hearing aid order, click the button below. Included in the box is thin tubing that is best for helping the higher range of frequency, a power upgrade package for more low frequencies and volume, and a variety of tips to find the perfect size for your comfort. Effective, convenient, and easy to use, the HearClear HCEQ is ideal if you need a “boost,” and appreciate the convenience of today's modern technology. Warranty Included: 6 Month Limited Warranty and 30 Day Money Back Guarantee—Risk-Free!